This past week has been FILLED with letters (thank you Anna! ), some of which have given the harrowing details of the last illness of William Gosling, senior partner in the banking firm Goslings and Sharpe – and my Mary’s father. Mary lost two family members in January 1834 – her brother William also died (of scarlet fever). But it is from a diary, written by a young girl who, though ever so nominally ‘related’ to the Smiths and Goslings, probably never met any of them. The connection is Mrs Thomas Smith – sister-in-law of Joshua Smith, she was Great Aunt to Emma and Charles Smith; and through her own sister Juliana (née Mackworth Praed), aunt to the diarist Emily Shore and her sisters, as well as Winthrop Mackworth Praed. It is May 20, 1835 – and Emily Shore and her mother have been invited to visit a London family. Oh, Emily has some very choice words to say about the fog, smog, smoke of London. The country-girl was unimpressed. So how wonderful to then read what DID impress her: Portland Place! “We avoided the City altogether, going by the New Road, through Regent’s Park. I was altogether disappointed in the Park. I had expected at least to see fine timber. No such thing. The horrid atmosphere of London checks all vegetation. As far as I could see, there was not a tree in Regent’s Park to compare with the greater part of those in Whitewood. Besides, the sky is smoky and dingy, there is not freshness in the air, nor the bloom of spring everywhere, as in the country. It has also a formal look; it is intersected with wide public roads, which are inclosed by hedges or railings. These roads were full of carriages, cabs, horsemen, and pedestrians, which are supposed to give so much liveliness to the scene; so they do, but I like a retired, unfrequented park much better. To remind Two Teens in the Time of Austen readers, the Goslings lived at No. 5 Portland Place, and the Smiths were next door, at No. 6 — No. 5 is the address in the middle, with the “longest” yard and “shortest” house (click to enlarge map), and at the right (with the white pilasters) in the photo below, which looks UP the street from Langham Place; Regents Park is at the opposite end. Today I found Jane Austen’s Matchmaker — what looks to be a really fun game to play, and of course for the Austen fan a “gotta have that” item. You’ve still a week (until 28 Sept 2014) to pledge – and there’s even time enough to receive your “gift” before Christmas! A Ruthlessly Romantic Card Game! Yesterday, searching for information on a ship of the line toured by the young ladies from Erle Stoke Park — HMS St. George (90 guns) and those who sailed on her in 1792, I came across the most arresting portrait, in oils, of a very mannish-looking woman. Was the sitter who I thought? Indeed! a genuine portrait of le Chevalier d’Eon! The blog post I found is a couple years old, and tells the story of art dealer Philip Mould “uncovering and identifying” the sitter. Evidently the National Portrait Gallery snapped it up. Frankly, how could anyone mistake the sitter – d’Eon was my first thought when the image popped up on my screen. To understand the full d’Eon story, I refer Two Teens in the Time of Austen‘s readers to a biography by Gary Kates, Monseiur d’Eon is a Woman: A Tale of Political Intrigue and Sexual Masquerade. I remember buying this book like it was yesterday (alas: more like 2001! assuming it was newly out in paperback). I was visiting Dartmouth College, and going to Hanover ALWAYS meant a visit to the delightful Dartmouth Bookstore (now – alack!! – nothing more than another Barnes & Noble). I always searched a couple of sections: history (mainly Britain; France; Austria); biography; travel; and remaindered books in the back of the basement. I still remember where these departments used to be located! D’Eon must have been in the history section (France), or maybe Gender Studies. I had gone down to New Hampshire by myself that day, and the sun was shining gloriously – I pulled into a park area near the river and hurriedly unwrapped the book from its bag, to look my treasure over more carefully. I had never heard of Charles d’Eon de Beaumont. I’ve pulled the book off the shelf again, and will have to give it a look-through, if not a re-read — now that I know what she looked like. Although it’s no longer summer 2014, I can’t help but come across items relating to Oxford — which is what opens my book (in the year 1814). And this past weekend uncovered a few nice *finds*. I invite readers to Take a Tour of Oxford via OXFORD HISTORY. It’s been years since I clicked photos of places I’ve visited — so I have nothing of my own to share. Oxford had the dubious distinction of being a bit of a “lay-over” spot. I had taken the bus from Aylesbury into Oxford in order to take the train a few stops south – in order to meet a private collector with whom I’d been corresponding. She had family letters! Long story short: I went for a walk; got lost. BUT: I stood on the very spot — under “the Great Bell called Tom“ — that little Mary Gosling, aged 14 stood upon 200 years before me. A proper tour through the city awaits another trip. 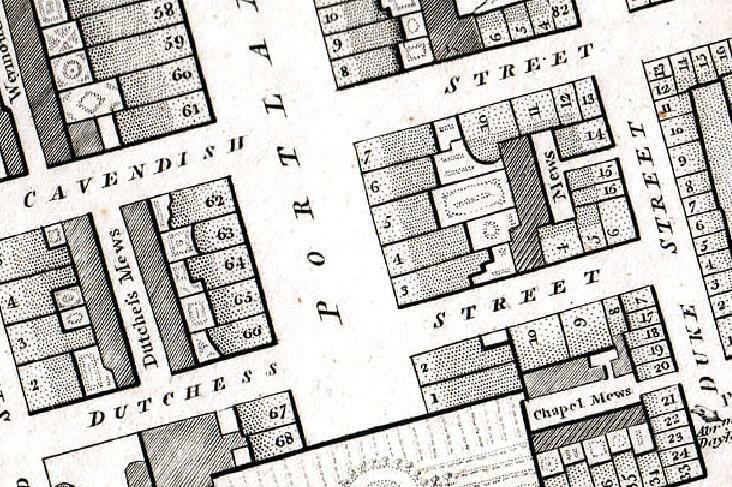 Looking for information on Oxford back in 1814, in particular on the old city walls, is how I came across this delightful website. There IS a “Oxford City Walls” tour – and it’s presented online, with some really nice photographs of the sites. If you explore the Walls circuit, you will cover some of the same ground I did: How well I remember the Castle Mound and Castle Street — and (having gotten “lost”) it’s a pity I never ended up at the appropriately-named Turn Again Lane! The boys were at two different colleges. Robert at Christ Church (Mary seems very unimpressed with his rooms in the Peckwater Quad) and William at Brasenose. OxfordHistory.org also dedicates a page to the old Star Inn, where the Goslings overnighted (alas, no longer in existence). The Emperor (tsar) of Russia – and his sister (shown in the full cartoon) – sits on the right hand side of the Prince of Wales; the King of Prussia on his left. In the “Smith & Gosling” family it is often DIFFICULT to differentiate the generations: so many similar (SAME) Names! Richard Seymour speaks of his father with such great affection and attention to detail in the Memoir of Rear Admiral Sir Michael Seymour, Bart, K.C.B. that I leave it to him to tell you about Sir Michael “the father”, as I call him. It’s Richard’s brother, Sir Michael the son, that I want to say a few words about tonight. Michael grabs my attention because he married Dora Knighton – daughter of Sir William Knighton, a confidante of the Prince of Wales/George IV. Richard writes of this cousin, often distinguishing her from his sister Dora (yes, there were TWO Dora Seymours!) by referring to her as “Dora K.” She is a sweet-faced young lady in the portrait of her by Linnell. Dora (Knighton) Seymour interests me intensely! But it’s her husband that I find more information about. An item readers of Two Teens in the Time of Austen will be surprised to hear: Captain Michael Seymour served under Vice-Admiral Sir Francis Austen, Jane’s brother. See this inquiry into the service details of HMS Vindictive. Years ago I visited Dartmouth College library several times a month – I had a quarter-year pass to borrow books. A hectic summer, but a productive one. Surely it was during that summer that I spotted, on the shelf in the darkened bowels of the library where books of English history & biography are stored, the three-volumes that make up The Wynne Diaries. Although the published diaries include entries by three Wynne sisters, it is Betsey Wynne — the future Lady Fremantle, wife of Admiral Thomas Fremantle (one of Nelson’s “band of brothers”), who makes headlines. Both the newspaper article and the talk cited below list the impetus for Elaine Chalus’ interest in her project: Her finding a worn, old Penguin paperback, a one-volume reprint of the original Oxford set. I never knew such existed, but even if I had – the lover of “complete” editions in me would had brought about the same search for the full three volumes (1935-1937-1940). I found them, online, pricey but far less so than the current offers. And my trio had their dust jackets! Needless to say, I’ve been eagerly awaiting Chalus’ biography, The Admiral’s Wife, so this recent 75-minute talk was a nice find, although I do wish Betsey were less “seen through the eyes of her husband”, but given its title, ” ‘My dearest Tussy’: Family, Navy and Nation in the Fremantle Papers, 1801-1814″, the talk should be forgiven for being a bit Thomas-Fremantle-centric. Being women’s history, its firm association with Nelson will undoubtedly help sales once the biography finally hits the shelves. Was looking at the online “sample” copy of WOMEN’S HISTORY MAGAZINE; it’s from 2011 – but a wealth of information means it’s still worth a look, three years later. My favorite story is by Julie Day, writing on “Household Management as a method of authority for three 18th Century Elite Yorkshire Women” – which focusses on three women: Sabine Winn, of Nostell Priory; Frances Ingram of Temple Newsam; and Elizabeth Worsley of Hovingham Hall. I cannot stress enough how fascinating an article was made by intertwining these lives; the focus is on finances and household management. HIGHLY recommended. Julie Day’s PhD dissertation, Elite Women’s Household Management: Yorkshire, 1680-1810 might also be of interest to Two Teen readers.